The Atlas of Earth-Prime explores the world of Freedom City and Emerald City for Mutants & Masterminds, Third Edition in greater depth and breadth than ever before! It looks at nations and regions around the globe, at the heroes and villains who call those places home, and at the fantastic and dangerous phenomena found there. Heroes! 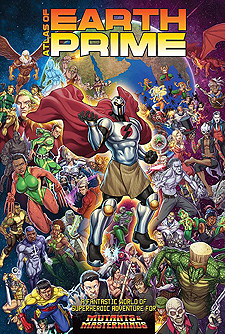 The champions of nations around the world, from the armoured Aziz in Iran, to the brilliant Zingizi of the South African Super Hero Alliance. Villains! See the threats looming in different nations, from the trickster spirit Anhanga in South America to Zhizn of the Horsemen Super Soldiers of Eastern Europe - dozens of characters across a wide range of power levels. Organisations! learn about the international agency UNISON (the United Nations International Superhuman Oversight Network) and the world-spanning threats it monitors. Adventures! Everywhere are adventure hooks and opportunities to give a group of heroes a true world of adventures. Take the heroes of your Mutants & Masterminds series on a world-tour, or create a world-spanning series with characters from across the globe. Bring allies and enemies from around the world to the city your heroes defend, or unite the heroes of Earth against the greatest of threats.